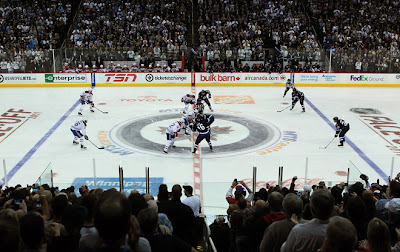 The Montreal Canadiens may have come into the MTS Centre and spoiled the Winnipeg Jets return to the NHL party Sunday night, but the fact of the matter is, Jets fans, en mass, don't seem to mind that much. Because NHL hockey is now officially back in Winnipeg, Manitoba. Ever seen a team get a standing ovation during the final minute of a home opener when they got beat 5-1? Chances are, the Jets are in elite company there, and they have their fans to thank for that. Reality is, Winnipeg fans couldn't care less the score of the game, even though they would have rather seen the five goals come from the boys wearing polar ice blue instead of bleu, blanc, et rogue. Winnipeg fans have their team back and True North did it in a very classy way. And boy did they cash in at the same time. Not only were fans given the opportunity to purchase limited edition game programs at the gate, they were given inaugural game lanyards to be able to keep their ticket stub as a memento of probably the biggest hockey game in Manitoba history. There was also the salute to the Manitoba Moose and the integral part they played in the return of the NHL during the pre-game ceremonies. To top the night's festivities off, True North and the 15,004 fans in attendance paid a tremendous amount of respect to former Moose, Vancouver Canuck, and most recently Winnipeg Jet Rick Rypien at puck drop as Rick's mother Shelley Crawford dropped the ceremonial puck at centre ice. The bottom line after a 5-1 loss to Montreal last night is that Winnipeg has found their heart and soul again and it lies with the hockey team they lost so long ago. Now that it's back, the city has life, a soul, a spirit, and those fans will hold on to their tickets for as long as they can. Because the Jets are back.